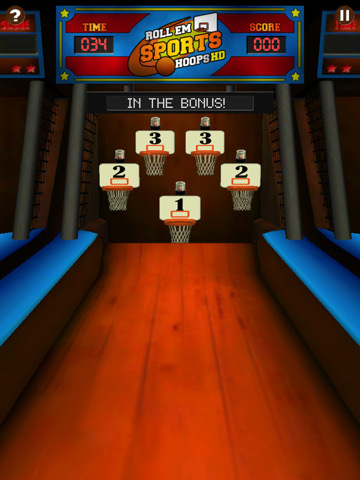 Roll ’em Hoops HD is a humorous take on combining shootin’ hoops and Skee-Ball. The graphics are so so and the game manufacturer claims to have very realistic physics. The physics were fine but the flicking of the ball up the ramp took some getting used to get it somewhat precise to where I wanted the ball to go. There are three types of rounds you can play, the first of which is the “In the Bonus” which basically requires you to get the ball in all of the different baskets to unlock various bonus rounds, gaining you more points in the limited 45 second timespan. 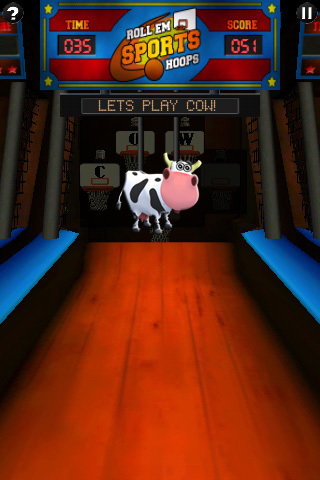 One of the bonus rounds even gives you the letters C-O-W and you have to shoot them in that order to get the bonus for spelling “COW” with your basketball skills. The second type of game play is “Old School” where you are given 50 seconds to rack up as many points as possible from shooting in the 5 baskets. I was able to shoot balls before my previous ones were even done. This was unlike what I experienced on “In the Bonus”. The third and final type of game is “3 Pt Shootout”. In this game, you are shooting your balls at one of 5 active “stations”. You get 5 shots at each station basket with the 5th shot, the money shot, being worth 2 points. The game also allows you to automatically and manually submit your score to Facebook, although this functionality was not tested. Overall the game could use a little work in improving the graphic texturing as well as the performance of certain animations (such as menus). Roll ’em Hoops HD is probably more worth $0.99 than the $1.99 its posted for. AppSafari review of Roll ’em Hoops HD was written by Kyle Hayes on October 5th, 2010 and categorized under App Store, Fun, Games, iPad apps, Physics Based. Page viewed 3670 times, 2 so far today. Need help on using these apps? Please read the Help Page.